Has a thought of making your own social networking website ever crossed your mind? Have you dreamt of creating a Facebook like website? A website where somebody could register himself or herself, make friends, share photos, music and a lot of interesting stuff too with friends? Or want to build a website, a niche community website to be exact, which could work as a platform where like-minded people interact with each other or come to know the people on some common basis like geo-location, language etc. You are in the business of web designing and some client asks for such a social networking website and unfortunately you don't know PHP programming. You are in a fix. Absolutely you do not need to. You do not have to hire a developer. You do not have to worry about the colossal expenses of hiring a developer and the subsequent development. We are not being too optimistic. It's completely true. In this time of ‘out of the box web software', it is not difficult to find many useful ready-made PHP software with the help of which you can build up a Facebook-like software very easily. So let's go ahead and get to know all those PHP scripts which not only provide advanced social networking features but also promise to shore up your site up from time to time by regular updates and a reliable support system whenever you need it. But before you settle your mind on some specific PHP software, you should keep the following things in your mind. How old is the company that is providing the software? What kind of technical support does the company promise to provide?. And one of the most important thing that you must be aware is the rate by which a company is developing the software in question. It is very important that the software should be regularly updated so that your social networking site could keep abreast of the ever changing trend and taste of internet world. Here we have come up with a list of reliable software that have made the list on the basis of their functionality, technical support, development redundancy etc. Unanimously and I think without any second thought it can be said that phpFox is the best available social networking PHP software. So, what is so special about it? Its highly promising feature is that this turnkey software resembles Facebook most. We have here used the word ‘resemble', which is not at all literal. Because it's not about Facebook-like appearance, it's about all the advanced features that Facebook boasts to offer like detailed user-privacy features, ajax notifications. All these features you can find here in phpFox. phpFox can be weilded for any social networking site. phpFox's ready-made themes are available too such as Facebook theme. You would be hard pressed to find a difference between Facebook and your phpFox website fashioned by its Facebook theme. Besides, if you want to give your site some specific style, it's also possible. So now it goes without saying that phpFox brings to you each and every basic essential option necessary for website styling. phpFox has its own add-on marketplace too. You can enhance the functionality of your website by using many free and paid add-ons. Before you jump the gun, let me tell you, fortunately there is nothing by way of cons. Do I require some programming knowledge to setup a social networking website with phpFox? NO. phpFox lets you build an advanced social website without coding. What skills do I need to give it a go? All you need to be familiar with is basic knowledge of hosting control panel. Can I create a website that looks like Facebook? Can I create a website that has options like Facebook? Is there any Android and iOS app available? Yes. But you need to buy them separately. SocialEngine appears to be as powerful as phpFox studded with almost all the features that phpFox possesses. Aside from basic merits and functions, SocialEngine also come as a hosted solution. Put it this way, if you are not comfortable with setting up hosting and managing software, you can leave it all to SocialEngine cloud plan, which can handle it all. Actually SocialEngine is available as a self hosted PHP script and a cloud hosted managed service. SocialEngine cloud gives you peace of mind. You need not to worry about server related issues such as software maintenance, managing server resources, site backup etc. SocialEngine support takes care of it all.. But SocialEngine cloud is still under development and short of many essential features such as membership levels, instant chat, page builder etc. To take advantage of all these features you need to use SocialEngine PHP edition. SocialEngine PHP edition is a self hosted php software that needs to be installed on your own server. You have to pay for it just once and it is at your disposal. One of the most powerful social networking php script backed by a team of rock-solid developers and technical support. Extensive functionality to setup any kind of social networking website. Fast, secure and reliable php script. Large theme and add-ons marketplace. Starting an advanced social networking website is a fun with SocialEngine. You can get it to work within hours. A drag-and-drop page builder to give your social networking website a peerless look. Complete HTML template editor for web designers. Create membership levels and allow select levels to access different features. For instance a free member can’t chat with others but a premium member can do (this feature helps make money in dating websites). Extensive sharing system like Facebook; sharing text status, photos, links with auto-thumbnail etc. Ajax notifications that display instantly. Instant chat windows for friends. forums, blogs, groups, classifieds, polls. Mobile app for Android and iOS (paid add-ons). By spending a few bucks, you can add immensely powerful and extra functionality to your website, thanks to the highly evolved add-on market of SocialEngine. Even you can obtain mobile apps for Android and iOS at a very affordable price. 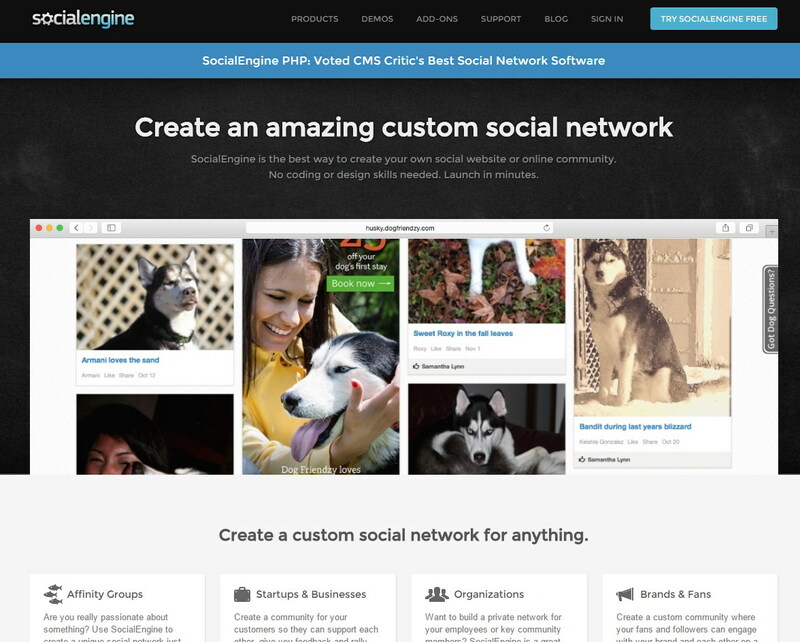 Do I require programming knowledge to setup a social networking website with SocialEngine? No. Absolutely not. SocialEngine comes with an admin panel with which you can customize several options and also you can create custom styles and layouts for pages. What skills do I need to get SocialEngine working? Yes. With SocialEngine simple styling options, you can give your website a Facebook-like appearance. Can I create a website that has functions similar to Facebook? mooSocial is being developed actively. easy to install, feature-rich admin panel and powerful frontend interface. Andoid and iOS apps are available. Add-ons and themes are limited. Some features such as classified ads are still missing. No onetime fees, you need to pay on yearly basis. Wall sharing is yet to receive some must-have features such as link sharing, video sharing, link preview etc. mooSocial is an excellent social networking php solution. mooSocial is a turnkey software that, like above described tools, provides best functionalities to start a powerful social website like Facebook. mooSocial was luanched back in 2012 and has been worked upon actively ever since. Consequently with each new release you get lots of new but impossible-to-get-along-without features. mooSocial, no wonder, is becoming more and more feature-rich and in many ways we can say now has an edge over phpFox and SocianEngine. In terms of price mooSocial is cheaper and its Android and iOS apps are also more affordable than those of phpFox and SocialEngine. Hassle-free installation wizard. Just create a database, upload files to the server and run the installation. Its easy step-by-step wizard makes its installation very easy. After installation your site can be ready-to-use within one hour of customization. Drag-and-drop page builder is a part of the admin panel. Fully OpenSource. you can edit every single line of code if you are know how to write or edit codes. Create different membership types and give them access to particular features. Instant chat system and private messaging. iOS and Android apps are available but you have to pay for them separately. Dolphin Pro is perfect for you if you want to kick-start your social networking website fully free. Truly with Dolphin Pro which is absolutely free, you are deprived of some good features but if you upgrade to its any of pro plan you will get many premium features such as Android and iOS app. Honestly Dolphin doesn’t match with Facebook in look and feel, but it's no big deal. When you will have a look on its admin panel, you find almost all the features that are required for building up a cutting-edge social networking website. Friendship and subscribe system, private messaging, instant messaging. blogs, groups, forums and even membership levels with different access rules are some of the most essential features that come packed with Dolphin Pro. If you use Dolphin Pro's free license, you will have to bear a “powered by Dolphin Pro” link at the bottom of your entire website. It is not bad if you use Dolphin Pro for non-commercial purpose. But you should use a paid license to get rid of “powered by” branding if you use Dolphin Pro for commercial purpose . Dolphin Pro is developing regularly to keep itself updated and we cannot help admiring their offer of a free license. But compared to phpFox and SocialEngine, the PHP script is yet to reach its acme. Much like SocialEngine, Dolphin pro can also be used in two ways: cloud hosted and self hosted. If you go for their cloud plan you will take care of the monthly billing, on the other hand if you plan to use their self hosted version, you just have to pay only once. Easy installation on server. If you choose their cloud based plan, you do not need to install it manually on server. Do I require programming knowledge to setup a social networking website with Dolphin Pro? No. Absolutely not. Dolphin Pro comes with an admin panel with which you can customize several options and also you can create custom styles and layout for pages. What skills do I need to get it started? If you go for their cloud solution, you can keep your worries about installing it on a web hosting at bay. But if you purchase its PHP version (which comes with more features), you must know how to work with web hosting file manager (or FTP) and how to create a database. There are some 3rd party templates but those templates can’t convert your Dolphin site into a mirror-image of Facebook. Can I create a website that works like Facebook? Dolphin, although, support many Facebook-like features but it lacks Ajax notifications and much more (such as extensive privacy options) which is very unfortunate. Lack of these features seems to keep it still way behind Facebook. Yes. Mobile apps are included in some paid licenses. Elgg is a free php script with the help of which you can setup a social networking website. If you want to start a non-profit social networking website or a social website just for fun, you can make use of Elgg to this end. However, it doesn’t necessarily mean that someone can’t create an advanced social engine with Elgg. If you are a developer you can utilize its core and build up a powerful social networking website, harnessing its powers it in your own way. But if you don’t know PHP and MySQL, you will have to rely on the given limited features in Elgg. Jcow was started as a free OpenSource project and in its early days it was a basic social networking script that offered a handful of basic features. Now that this script has come a long way, it is no longer free and you have to spend some money to put its alluring features to use. Like most other social networking software, Jcow, too borrows many features from Facebook such as Wall, Profile image, cover, status upload, groups, polls, fan pages, instant chat etc. Jcow, however is a good and affordable php script to setup a social networking website but it still lacks some essential features for a social networking system such as it has no Mobile App, no privacy options for users, no easy layout creator for admin etc. I am looking for a social network solution. I find SocaialEngine outdated and messy. PhpDolphin Pro is really updated and complains about bugs and imposible to update with community forums. I like phpFox new cache system, it speed up the script. However, ios & android apps with source code are not found anywhere. I like mooSocial beacuase it comes with ios and android app and source code. Let me correct you, there is a one-time purchase options like phpFox has.